Today I spent the day in Dolores Park with a new friend and her sweet boyfriend. I told them the Sunday-in-the-park version of the fell-of-a-balcony-almost-died story. I focused on gratitude and ended with the sticker as I wrapped it up. As I finished the story and we all appreciated the importance of being grateful to be alive, I threw several stickers at them as they both showed me the goosebumps on their arms. Five minutes later I stood up and noticed a woman on a nearby blanket with my sticker on the back of her jacket. I quietly pointed it out to my friends and asked if one of them put it there. They hadn’t. She had no idea it was there but once I told her, she and her friend continued to check on it and make sure it was still there. So I threw three more stickers into the middle of her group and we all went on our way. Bless you park strangers. 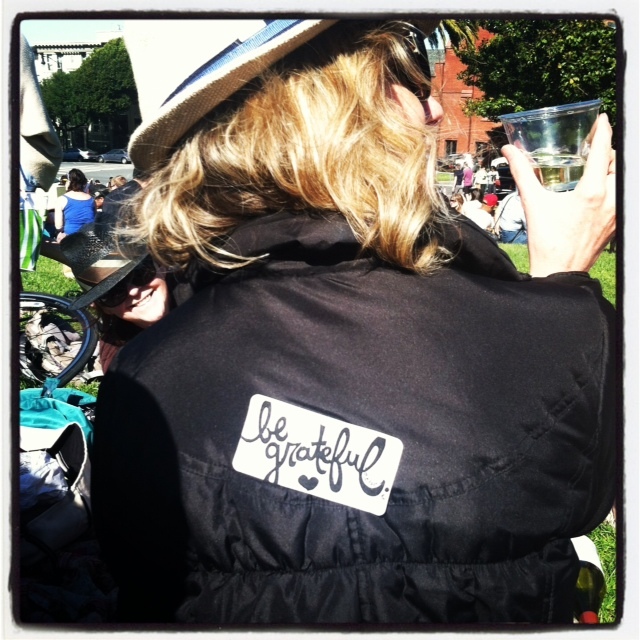 WE ARE GRATEFUL.